Escaped to Hunter Mountain in upstate New York for a quick ski lesson. I need all the help I can get so a quick day trip to follow-up on whatever was learned the last time I skied. The drive from New York City was a solid two hours and more with traffic (got Zip Car back late thx to traffic). Am always trying to find some time to get outside and this week managed to pull this off. I had a great instructor who I would recommend, George Schneider, who didn’t waste any time taking me to the top of the hill (though a short one). It would be great to have two weeks of skiing, but I’m not really seeing a ski vacation on the horizon — am much more beach/sail focused. I will work on practicing though and looking to try Mountain Creek in New Jersey. It’s closer and the hill (mountain) doesn’t make that much of a difference — at my skill level snow is snow. The trip to Hunter Mountain (800-486-8376) was mostly via I-87 and there were no shortage of State Troopers writing tickets. I think my GPS (iPhone running CoPilot – poorly) clocked in around 120 miles door-to-door. Did the whole thing as a day trip but the town looks like a good option for a mini-vacation with antique stores, small B&B’s, bars and restaurants. Maybe not now, or for me, but for anyone who wants to get out of the City and explore upstate, Hunter is a good option and is past New Paltz (someone should build them a website) in the Catskills and not far from Woodstock. And you can learn to ski. Gear: Have all I need and rented ski’s, boots, poles AND helmet. Patagonia gloves were not up to keeping fingers from freezing after a couple of hours, but other than that all good. 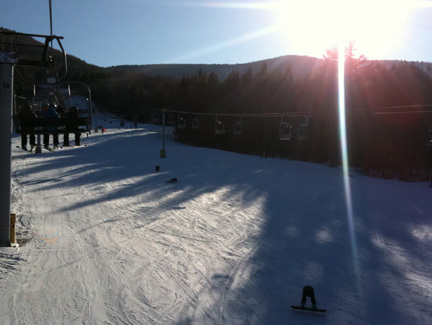 This entry was posted by John Pasmore on Saturday, February 13th, 2010 at 10:06 pm	and is filed under New York, Outdoor and tagged with Hunter, Mountain, Resort, Ski. You can follow any responses to this entry through the RSS 2.0 feed.